Cerberus FTP Server provides powerful, multithreaded FTP server performance without sacrificing ease-of-use. Designed to use very little CPU and memory, it features a user-friendly interface that can be easily hidden or accessed from the system tray. The server is able to listen for connections on multiple interfaces (Multi-homed PCs), run as an NT service, resume failed transfers, and offers an easy-to-use manager for controlling user access to files and file operations. 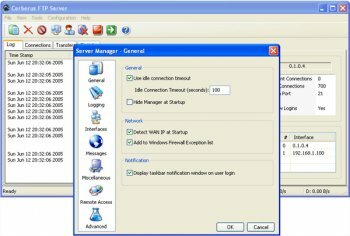 Connection limit, timeout, and IP access can be controlled by the administrator as well as a variety of other settings. In addition, it offers statistics on connections as well as robust logging capabilities. The server adheres to RFC959 and RFC1123. We purchased this for our company about 6 months ago and it has been great. The auto-blocking IPs is a great feature. We were able to import our existing users from a different ftp server into this through a csv file. Overall it is a good product and would recommend this. One of the best FTP servers available, but the price is way too high IMO ($80 for the personal edition). Been using Cerberus for years. Awesome FTP server and they've added some really great features in 3.0. I've used a few different FTP servers and have generally been disappointed with usability and reliability. I've been using Cerberus FTP Server for a few months now and have found it to be very fast, reliable, and light on resources. It has support for newer FTP commands and the virtual directory system is extremely simple to set for a user. It is a great FTP server. Serv-U 6 allowed the same kind of flexibility with virtual drives that the reviewer below is talking about. I hate Serv-U 7 too much to know if it still does. I was unimpressed with this FTP server, free for personal use or otherwise. Other reviewers don't seem to grasp the concept of this FTP server. Cerberus let's you create virtual directories. If you've ever setup an FTP then you probably know that others only let you choose a root and you are stuck with the contents of that directory and you must put every you want to share in that directory. Others have workarounds but they don't work as seamlessly as this server. Are more complex servers, more secure? Yes. Easier to use and the flexibility of adding any directory? No. Also, it is free for personal use. Still a very good ftp server but there are no speed limits. Every other ftp server out there has that option but for some reason, it's missing from Cerberus. Too bad, it could be one of the best. been using this for over 2 years!!! and it has all the features i need! not to mention the virtual drive/directory system is so simple to use and works flawlessly. Cerberus FTP Server was enjoyable experience very easy to understand and a delightful user interface.